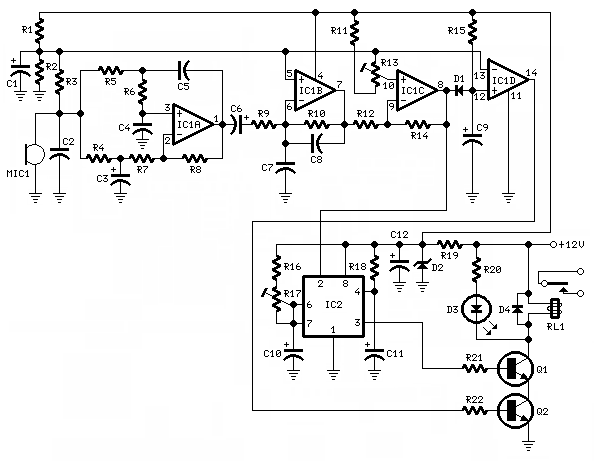 This circuit is able to instantly detect the small variations in air pressure caused by the opening of doors and windows. Unlike other anti-theft circuits or sensors that can not be used when someone is at home because the slightest movement would trigger them, this circuit allow you to move easily within the premises and will activate only when opening doors or windows. This feature will allow, for example, its use in small shops, to signal the opening of the entrance door and the entry of a customer. Therefore, it can serve not only as an alarm but also for counting purposes. No special purpose sensors are required: a common Electret Microphone capsule will do the job. IC1A amplifies the signal picked-up by the microphone capsule MIC1, cutting heavily the pass band, in order to select only the very low part of the audio spectrum, given that the signals of interest for this circuit are in the 0.5-1.5Hz range. IC1B produces further amplification and tailoring of the signal and IC1C acts as a trigger, whose sensitivity is adjusted by means of Trimmer R13. IC1D inhibits the output Relay through Q2 for some seconds (time constant set by means of R15 & C9) when the circuit is triggered by the opening of a door or window, in order to allow some time delay before the alarm starts. IC2 has a double timing function. When the power is applied to the circuit it inhibits the output Relay for about 15-20 sec (time constant set by means of R18 & C12) in order to avoid false triggering and, more important, to allow the operator to exit the room and close the door before than the circuit starts operating. The main timer of IC2 is used to set the duration of the alarm. This delay is variable by means of Trimmer R17. Q1 and Q2 are wired in series and form an AND gate: the Relay will operate only when both transistors are in conduction. The circuit is powered at 12V (battery or dc external power supply adaptor) but the two ICs use a 5V supply, derived by means of R19 and fixed by the Zener Diode D2. If you want to operate the whole circuit at 6V see Notes. D3 and its current limiting resistor R20 are optional, but the LED can be useful during setup procedure and to signal the Relay operation when the circuit is used without an audible alarm. For 6V operation you must use a Relay having a coil suited to this voltage and change R19 value to 100R and R20 to 470R. Due to its low current drain when idle, this project is suited to battery operation. Standing current: about 10mA @ 6V and 12V supply.